The Lord of the Rings Online, an award-winning fantasy MMORPG from Turbine, is getting yet another large expansion on November 18th. The Helm’s Deep expansion is going to be expanding on the epic storyline of the game, which follows a path peripheral but often intertwined with the protagonists of Tolkien’s classic tale. In the developer’s tour of the expansion, I got to have the first look at the most highly anticipated aspect of the expansion: a total gameplay overhaul. This is the kind of thing that developers lose sleep over, as a complete mechanics and class overhaul can either cement an aging game into the pantheon of hits, allowing the devs to build further on it in the future, or create a catastrophic uproar among the community it will never recover from (Star Wars Galaxies springs to mind). Some of the changes coming in Helm’s Deep are enough to light the LOTRO forums on fire with doomsaying and speculation, but my experiences with the devs in this walking tour of their process was illuminating. And not in a bad way. 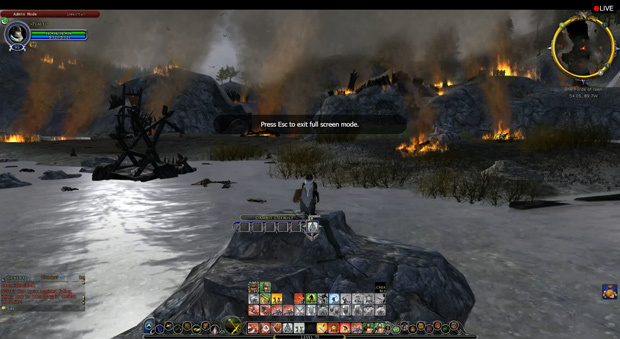 Aside from some minor technical issues with the video feed, I found myself admiring the professional candor of the LOTRO team. They have a clear vision for what they’re doing, and they’re able to defend these core changes from community paranoia, while simultaneously taking in and implementing beta feedback with rapid responses. They’ve taken full advantage of some of their elder players and class professionals in the beta, and have been implementing sweeping changes and updates to their beta build on a weekly basis. They could not be taking this more seriously. Competence is a rare and beautiful thing, and the LOTRO team has plenty of it. The first thing that’s flying out the window is LOTRO’s aging trait system. The virtues and deeds are remaining, allowing players to earn character-defining stat perks just like before; but now, players earn trait points, much like the talent points of yore, and use those in (you guessed it) trait trees to define their character’s path and specialization. 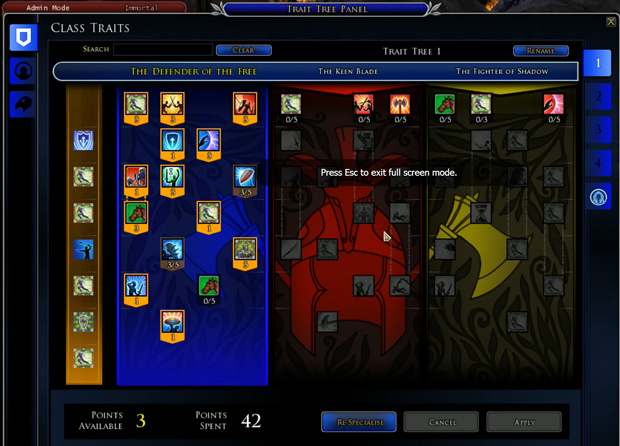 A player is able to pick a specialization early on, and receives unlocking benefits for investing in their primary tree, while having a point penalty for spending trait points outside of their specialization. This encourages focus, while stilling allowing for a bit of choice hybridization, if the player so desires. The stated goal of these fundamental changes by the devs is to make LOTRO’s admittedly limp-wristed combat feel much more impactful, engaging, and fun. To this end, many passive, dull utility skills have been made much more active. For example, a captain no longer buffs her allies through a thirty-minute cast-and-forget ability. The captain instead is rewarded with group buffs by actively participating in combat and using their abilities. This is just one example of how the “more active combat” goal is being implemented. Chronic mouse-clickers will also be pleased that reactive abilities will appear during their windows of opportunity on a special UI bar near their cursor, further minimizing the amount of deft keystroking and juggling a player has to do in a game that’s notorious for filling action bars with skills upon skills. Some of the changes are a huge breath of fresh air for classes that were otherwise a bit one-dimensional. The hunter, LOTRO’s go-to ranged nuker, seems to have been one of the most overhauled classes. Being a pure DPS class, three separate trait specializations will have a difficult time not being redundant. So, the LOTRO team has made three unique playstyles: a mid-range skirmisher that can attack while moving without penalty, a stationary long-range nuker, and a crowd-control/trap focused fighter with some unique, flashy abilities (The One Trap, for example, has some satisfying spike action, in addition to having an amusing name). Monster play (LOTRO’s unique PVP system) will also be receiving some love, with the “Creeps” (monster characters) receiving new ways to specialize and empower themselves. The armor-swapping issue for Freeps (Free Peoples, or non-monster players) has apparently been addressed, and annoying Hobbits will no longer be switching gear sets in the middle of PVP events. This has apparently been a long-standing complaint among monster players. These are just a few examples of how the LOTRO team at Turbine are bringing their aging game well up to date. While many players still fear that the changes could ruin what they’ve come to know and love, my experiences with their tour were largely positive. As a fan of the game myself, I think it’s safe to say that these changes and additions to the game will bring a glorious breath of fresh air to an aging classic, allowing the devs to expand in the future with a brand new, easily-managed and intuitive system. As an on-again, off-again player who has always been enchanted by LOTRO’s aesthetic, storytelling, and vibrant community, I’m very excited for these upcoming changes to the game’s ancient class and combat system. The core gameplay, while solid and decidedly old-school, was always the one thing keeping this generally fantastic game from being The One MMORPG to Rule My Life. With any luck, the Helm’s Deep expansion is going to take LOTRO from intermittent diversion, to my very own full-on gaming commitment. Either way, the changes slated for the expansion are intended to be the dev team’s“opening argument” for a more comprehensive overhaul of the core mechanics, and is in no way going to be the final effort. This is a game with devs who are looking toward the long haul, and very much appreciate and respect their community, while simultaneously making executive decisions about the design and keeping players in the how/why/when of it all. If you haven’t played LOTRO yet, or quit a long while back, Helm’s Deep is a great time to drop in and see if the fires of interest are kindled anew. It’s free to play, after all. You’ve got nothing to lose but hard-drive space. To get a better visual of the changes, you can catch today’s devblog showcasing the thought process behind a lot of these changes.